After talking about it for a few years (since the last time it was in NYC,) I went to BlogHer's annual conference this year. I don't know many bloggers, and the ones that I'd really consider friends aren't really nearby or were travelling to the conference this year. But at the end of it, I feel a little better about my little blog here. It's just my corner, my soapbox. This is also my first post using Zemanta, who I met in that Expo hall. Lovely ladies, and hopefully something useful for the blog. 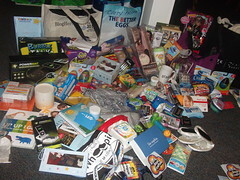 Here's a Photo Montage from BlogHer'12! dang look at all that loot! next time count me in... we'll be partners in crime..